Breakfast and Program: 8:30 a.m. 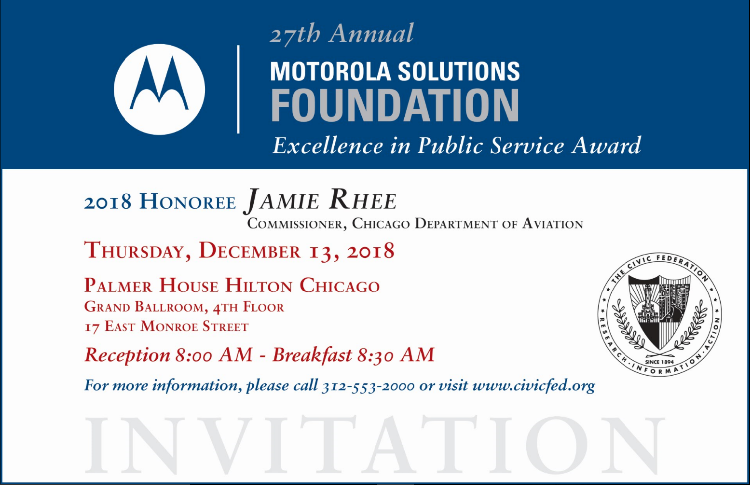 The Civic Federation is pleased to announce that Jamie Rhee, Commissioner of the Chicago Department of Aviation, will be the 2018 Motorola Solutions Foundation Excellence in Public Service Award honoree. Ms. Rhee's distinguished career in public service spans more than two decades. In her current role as CDA Commissioner, she oversees Chicago’s two international airports—Midway and O’Hare—which generate an estimated $60 billion in combined annual economic activity. Previously, Ms. Rhee served as the City of Chicago’s Chief Procurement Officer, during which time she was responsible for purchasing approximately $2 billion in goods and services for dozens City of Chicago departments, including the CDA, and the certification of thousands of minority, women-owned, disadvantaged business enterprises, as well as Veteran-owned businesses and businesses operated by people with disabilities and the Airport Concessionaire Disadvantaged Business Enterprise program. This year’s award breakfast will be held on Thursday, December 13 at the Palmer House Hilton, 17 East Monroe, Chicago, beginning with a reception at 8:00 a.m.
For more information or to RSVP to the awards breakfast, please contact Rina Tsang of PJH & Associates at 312-553-2000 or click here. Communication Access Realtime Translation (CART) services will be available. Please indicate any additional special accommodations needed via RSVP or contact Rina.